Normally, the lack of rain is hardship but when capping a spring, it’s a blessing. 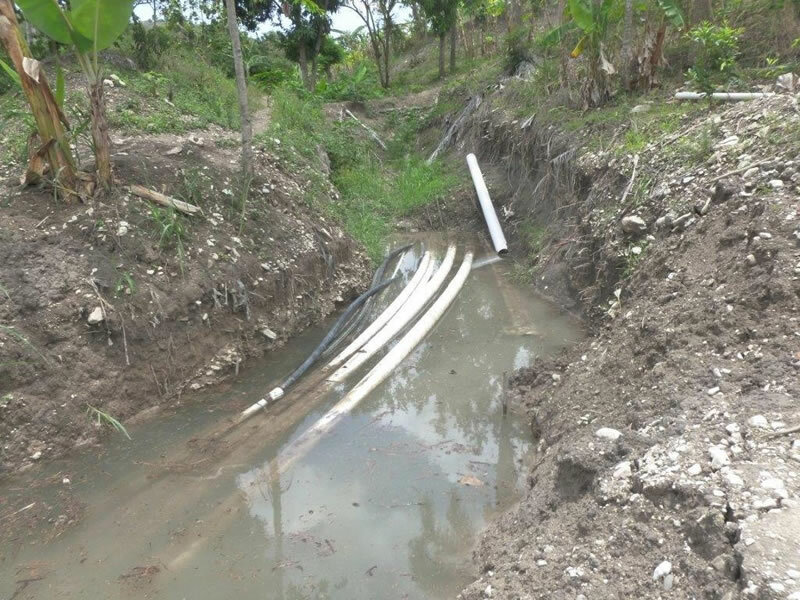 NW Haiti has been a five month drought but this has helped the spring capping at Source Lanon to proceed. During drought from November 2013 to the end of April 2014 a lot of work was done on the pipeline and spring capping. 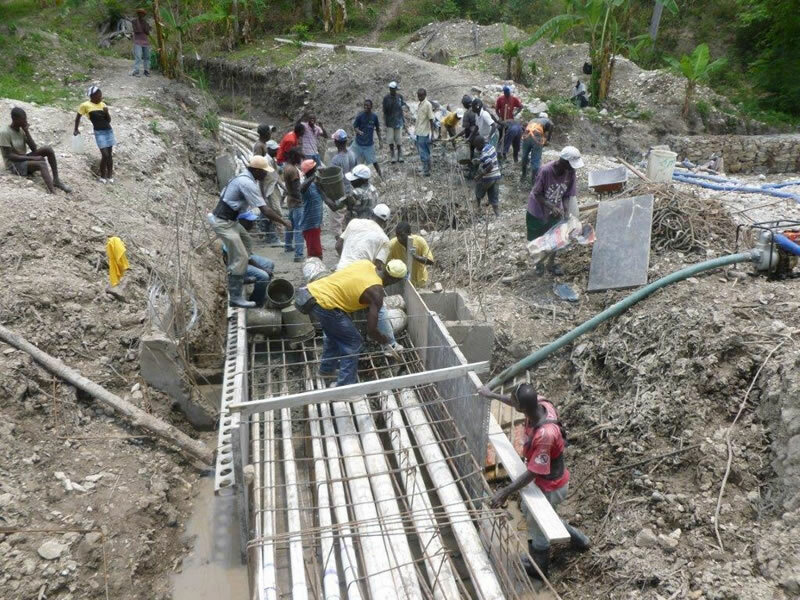 The effect of the torrential rains that eventually flooded the work in progress at the first river crossing is shown below. It took repeated attempts and digging out and cleaning up to get concrete and pipes across the river. Notice the concrete forms barely sticking out of water. After the trenches were drained from the rains, the pipes were covered in concrete for the river crossing. marks from jackhammer on the rock walls. This is one of the things that made the spring capping such a challenge. In some places near the source, the men had to jackhammer the trench five feet wide and fourteen feet deep in rock while in other places had to dig in dangerously soft and wet ground. 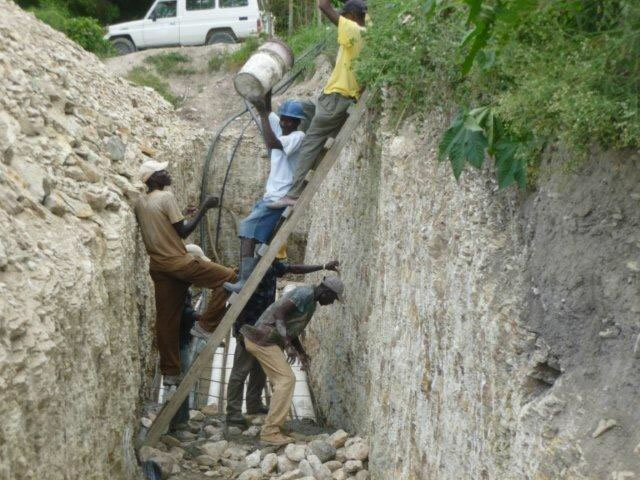 There are no big concrete mixer trucks in this region of Haiti. Concrete is mixed in small machines and transported into the trench bucket by bucket. 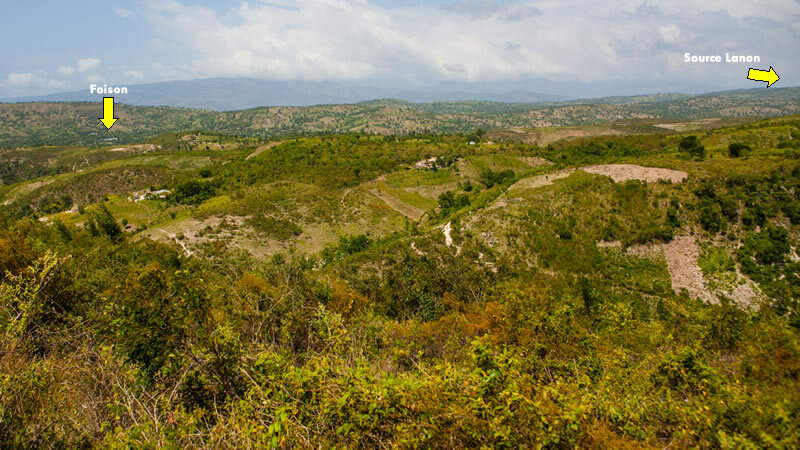 The spring at “Source Lanon” (pronounced “soose lan on”) is the largest spring in NW Haiti that has never been attempted to be capped. Currently, the people of this region get water from holes dug by the side of the river, a hand pump at the spring and from surface water at the spring (shown below). 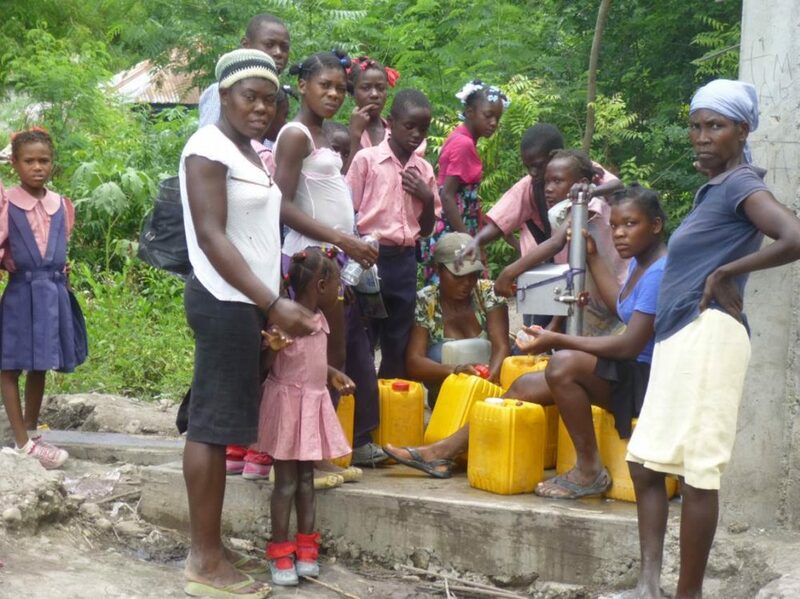 The nearest village is Foison and it’s residents suffer greatly from the hardships, diseases and risks associated with unsafe water. 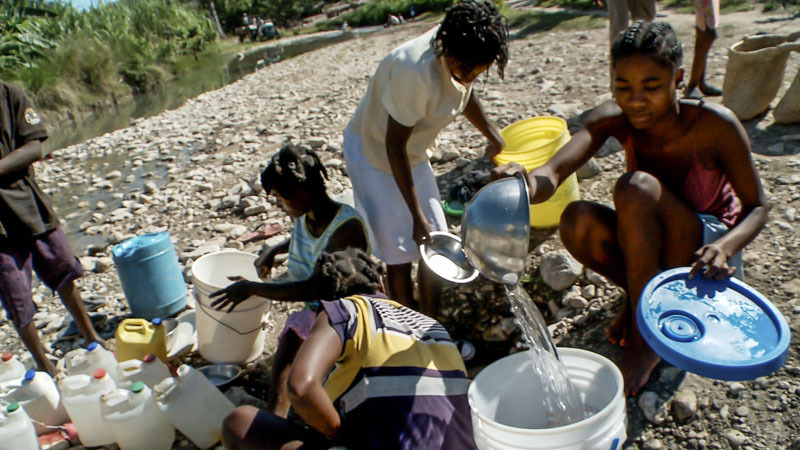 Since the 2010 earthquake in Port Au Prince, those risks now include cholera. 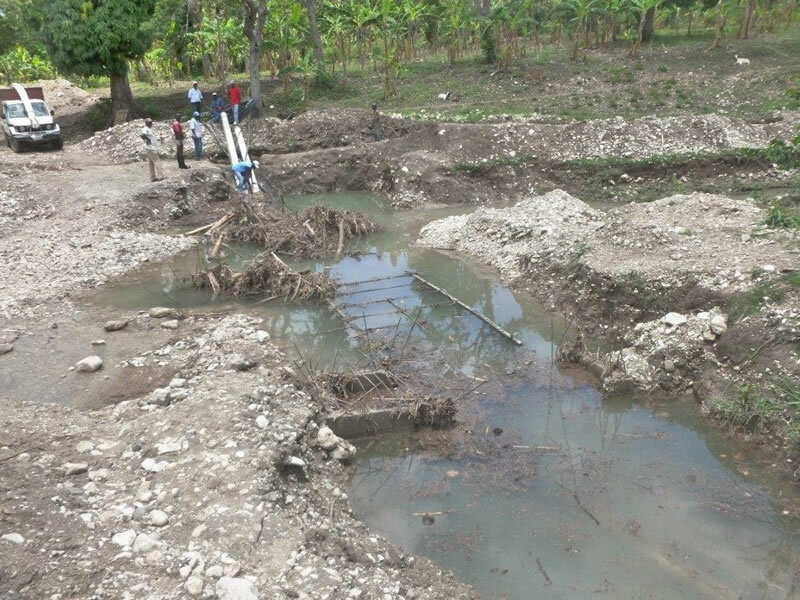 Once cholera gets in the ground, it can travel several feet and remain there for months. Getting water from hand dug wells as shown below is reality for the people of Foison. It’s risky but they have no alternative without the spring fed water system from Source Lanon. 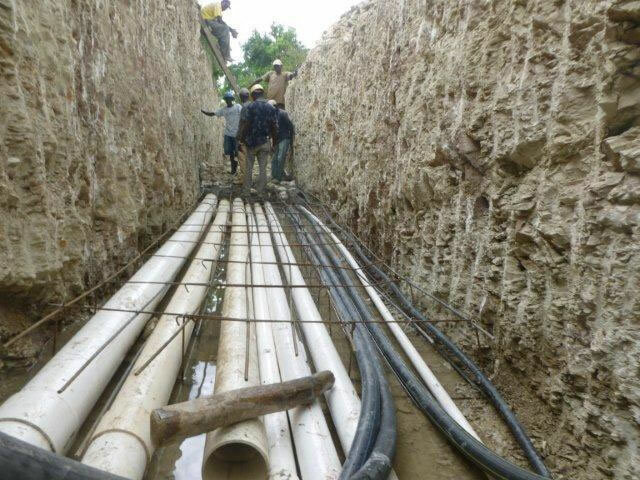 With enough funding to get started and run pipe to the first couple fountains, work on capping the spring at Source Lanon is scheduled to start in 2013. The spring is a difficult one to cap and much concrete will be used to cap it and channel it down the battle zone for distribution to the many villages downhill from the spring.